Is your kid's room small? No worries: This contemporary nightstand features simple lines that blend right into any decor and was designed just for tighter spaces! The furniture lets you picture a simple decor that's brought to life through the use of bright colors. Let your imagination go wild, and see where it takes you! 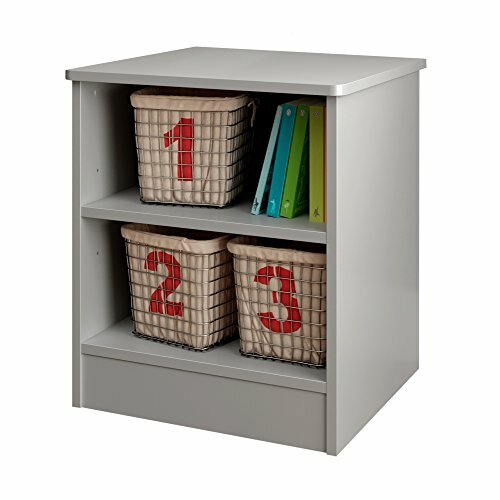 Features 2 open easy-access storage spaces . Ideal for bedtime books. Meets or exceeds all North American safety standards. Accessories not included. Requires complete assembly by 2 adults (tools not included). 17.75'' (W) x 15.25'' (D) x 19.5'' (H). Box dimensions: 23.897'' (L) x 16.181'' (W) x 3.937'' (H), 24 lb. Ships in a heavy box, make sure to have a friend with you. Packaging tested and certified to reduce the risk of damage during shipment. Made in North America with non-toxic laminated particleboard. 5-year quality guarantee. Any questions? Contact South Shore, the manufacturer, available 7/7 by phone, email or chat.